Genghis Khan, (I will use the spelling the author uses on both his and Sube'etei's names. I have seen them spelled three or four different ways) not the greatest conqueror in my eyes. That should be reserved for Timur, but Genghis Khan's descendants ruled the greatest land empire the world has ever seen, thanks in a large part to the actions of Sube'etei The Valiant. Within the first pages of the book we learn that the Mongol war machine was based on the Khitan one. The Khitan or Liao empire ruled half of what was to become Genghis's empire in the year 1000 A.D. The Khitans were a nomadic people who invaded northern China, and then were assimilated as the later Mongols and Manchus. Many times I have read that the Mongol way of war and their empire blossomed in a sea of nomadic tribes that only Genghis Khan was able to conquer, and then let loose on the world. So this part of the book is a revelation to me about another nomadic empire only a hundred years before the Mongols swept forth. The book itself is separated into two parts. 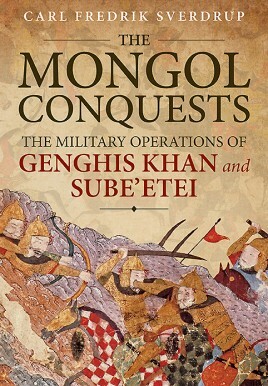 The first part is on Genghis Khans military operations, and the second part is on Sube'etei's. This is a book we have been waiting for for a long time. It is a no-nonsense strictly military history of the early Mongol conquests. Before this we have had to sift through either hero worship or damnation of the Mongol warriors. Did I forget that the book has maps? Twenty four of them to be exact. They go from the earliest campaigns of conquering other nomad tribes to Sube'etei's later campaigns in Europe. The book goes into all of the great Mongol victories, but also presents their defeats. Again, contrary to many earlier books the Mongols did not just spread like the plague across Asia. The were unstoppable under good generals and beatable under others.
" The march on Bokhara has capture the imagination of Western historians and commentators like no other Mongol military manoeuvre. Liddell Hart held:'Rarely if ever, in the history of war has the principle of surprise been so dramatically or completely fufilled.' The manuever quite likely surprised and unbalanced Muhammad as well as other military leaders, but it was hardly critical for victory: the Mongols were too strong. Had they marched directly on Samarkand they would surely also have prevailed easily. Temujin (Genghis Khan's given name) gained a quick victory because his army was very large and because the the enemy fortresses failed to hold out for very long. Muhammad was not a popular ruler: by 1210 he had only recently gained control over Transoxiana, and could not count on the cities to really support him. Transoxiana itself was economically weakened after the recent wars. The political and economic weakness of Muhammad probably explains better than the Mongol siege capabilities why the cities fell as quickly as they did." The author also shows the reality of the Mongol invasions and shows that cities that surrendered were not wiped from the map. The death toll has always been shown that the Mongols left a veritable wasteland behind their armies. This was most certainly not the case. He continues discussing the Mongol battles, doctrine of war, and siege capabilities, and their terror strategy. Appendix 2: Is a listing of all of the battles of the Mongols and their Allies from 1191 to 1242 A.D. This book is a treasure. The closest book I can compare it to would be Chandler's 'The Campaigns of Napoleon', and should be on every history lover's bookshelf.